Do you promise yourself you're going to get organized - but then not follow through on your promise to yourself? If so, you might find this book useful. Following Through provides seven strategies for ensuring we follow through on any type of good intention: to eat better, exercise, do our paperwork, actually act on those ideas we got at a conference, etc. The authors say that our intelligence leads us to decide what to do - but our "primitive guidance system" that controls behavior pays attention to our immediate needs, wants, threats and opportunities. So we need strategies to help us actually do what we intend to do. One of these strategies, called Spotlighting, involves providing cues to remind us of our intentions. There are many ways to do this; one involves using a device called the MotivAider (or any similar device) to keep our intentions in front of us. 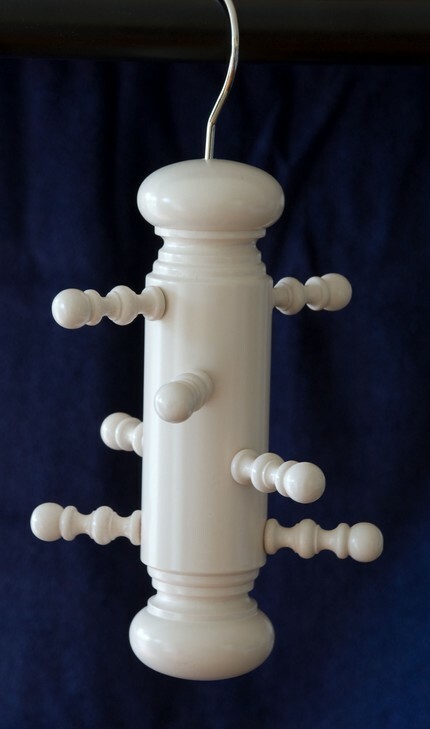 The MotivAider vibrates however often we set it to; each time, we're reminded to "practice good posture" or "drink water" or even "put things away in their places" - whatever we've chosen to associate with the cue. Another strategy, called Willpower Leveraging, has us make one not-so-difficult choice instead of many harder choices. For example, when trying to eat better, we can rid the houses of all the sweets we don't want to eat (and not buy more when we go shopping) - which is easier than deciding to ignore the call of the cookies once they are in our homes. I'm working on improving my eating habits right now, and I know this is a strategy that works for me! When discussing yet another strategy, Leading a Horse to Water, the authors give the example of Jesse, who intended to clean up his garage. "For weeks, every time he thought about getting started, he could hear his soul moan." But then Jesse decided to do just as much as he could with feeling no reluctance at all: putting on his grubby clothes, going to the garage, and stacking up the old paint cans. But he found that once he was in the garage, he did a bit more than he "had" to do. The next weekend when he went out to his garage with an "easy requirement" in mind, he wound up working for two hours. By the third time, he had totally completed the job. 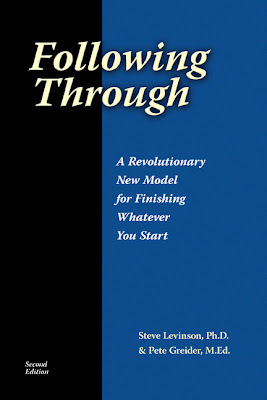 The book begins with some information on how the brain works, and why intention doesn't always lead to action. I would have liked this part to be more scientific; there is no mention of any studies that show what the authors are claiming. But the book ends with a section I really liked, on taking our intentions seriously - making sure we really want to commit to making a change, and ensuring we aren't overcommitting. And there's more information on author Steve Levinson's Habit Change web site. I watched the narrated slide show, and I loved the example of how one man got himself to exercise: he kept his only bottle of deodorant at the gym! So he could either be stinky all day, or go to the gym - and he'd feel silly going to the gym and only using the deodorant. While this might seem extreme, it's also a good example of how you can think creatively to ensure you do indeed follow through on your commitments to yourself. Noted added on May 1, 2010: I believe I heard about this book from Margaret Lukens at New Leaf + Company. Thanks, Margaret! And then there's the coffee filter holder from Skagerak Denmark - available here, among other places. Personally, I've never been fond of the pot racks that hang from the ceiling; there's something about having something hanging over my head that is bothersome to me. (And maybe it also has something to do with being short.) 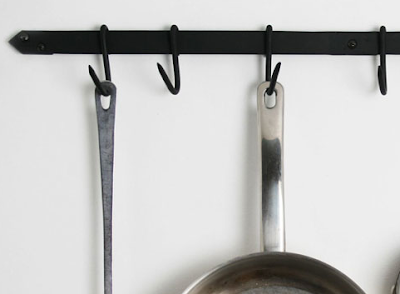 But wall-mounted pot racks are an entirely different story. 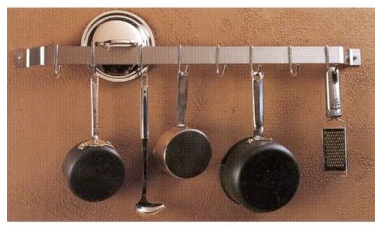 I'm finding two main brands of wall-mounted pot racks. 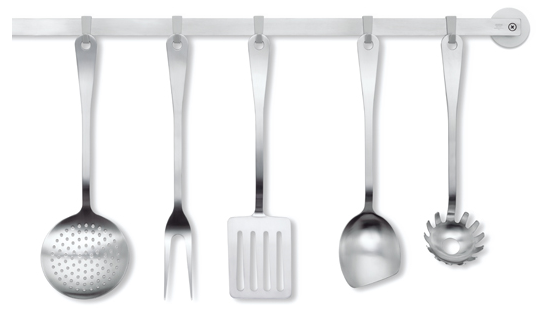 The first is Enclume, which has copper-plated, brass-plated and chrome-plated racks - as well as hammered steel. 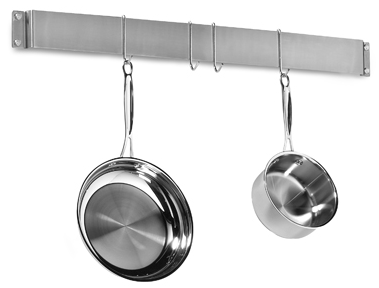 Some pot manufacturers, like Calphalon, also make pot racks. 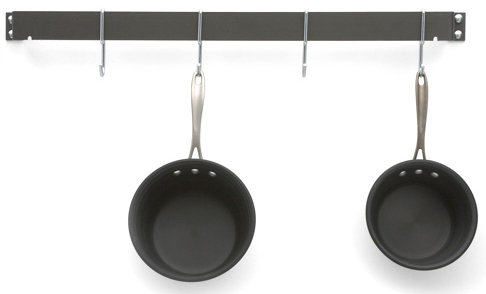 Cuisinart also has a pot rack - which I couldn't find on the company's web site! 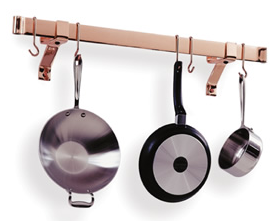 And if you want something special, check out the wrought iron pot racks from Kitchen Irons. 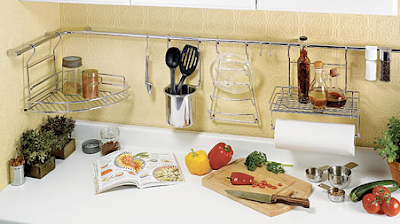 And of course, another wall-mounted option is the pegboard. Utensil rail systems can be hugely helpful in small kitchens with limited counter space. 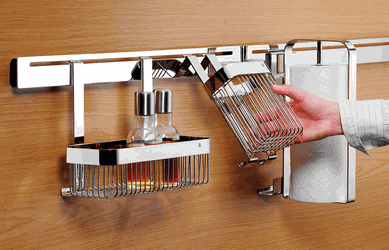 Ikea's Grundtal is one of the best-known rail systems, but there are plenty of other ones to choose from. I'll show you the ones that caught my eye. 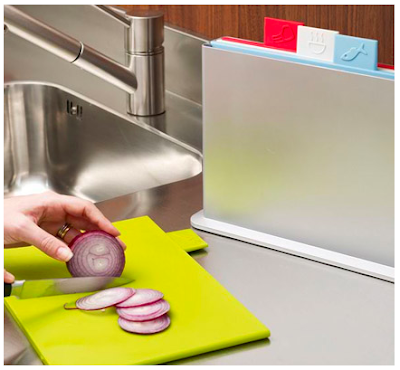 Brabantia's Kitchen Today system has a wide range of components. Lee Valley sells a wall-mount storage system with some unusual components: a cutting board holder, a lid holder, and spice jars that hook onto the rack. 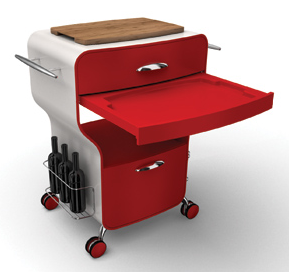 The Rösle Open Kitchen is another set with extensive options. 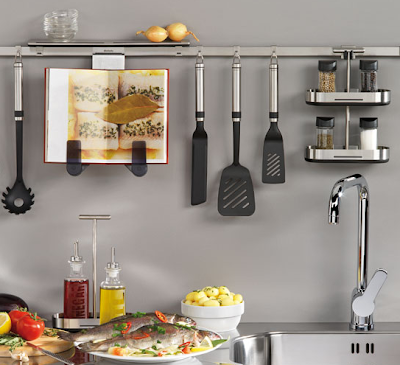 Finally, WMF has two options: the Vario Comfort wall system (shown above) and the Vario Fix system. 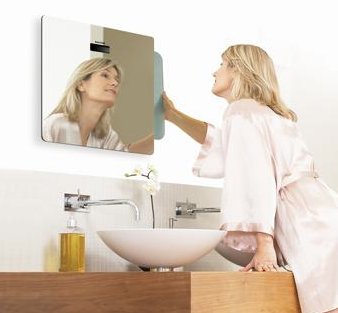 Update on Sept. 19, 2015: It seems as though the Vario Fix system has been discontinued, although you can still find assorted pieces on various websites. I totally agree with Naomi; square or rectangular containers make the best use of space. 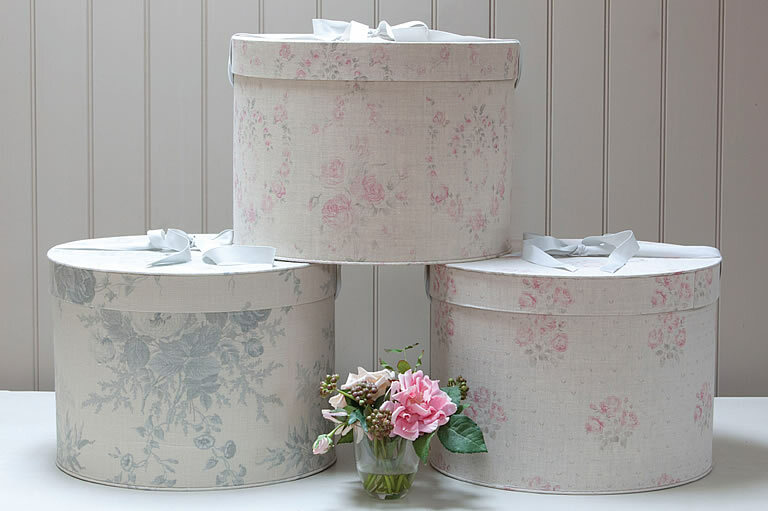 But if making the best use of space isn't a big concern - or if you have a hat to store - you just might want to look at those lovely round hat boxes. 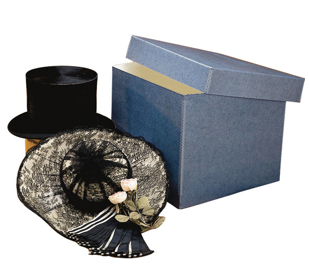 OK, the Lady Diane hat box above sells for $450 - and the clear, see-through ones from the same company cost $195 - but you don't need to spend that much money to get a nice hat box. 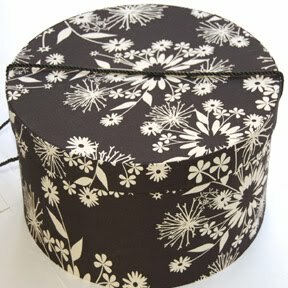 Hannah's Treasures makes bandboxes in various sizes - this one is a bonnet box - using vintage wallpaper. 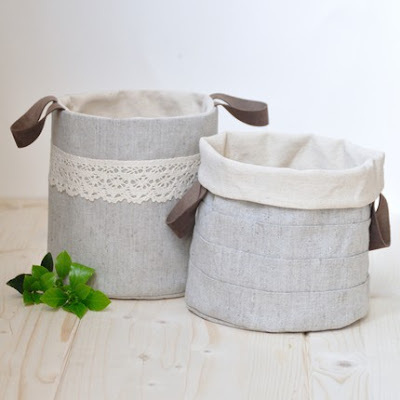 [via Such Pretty Things] Update on April 28, 2013: Hannah's Treasures no longer sells bandboxes. 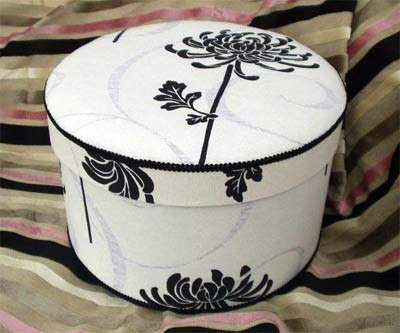 Over on Etsy, Tactile Books has some nice hat boxes. 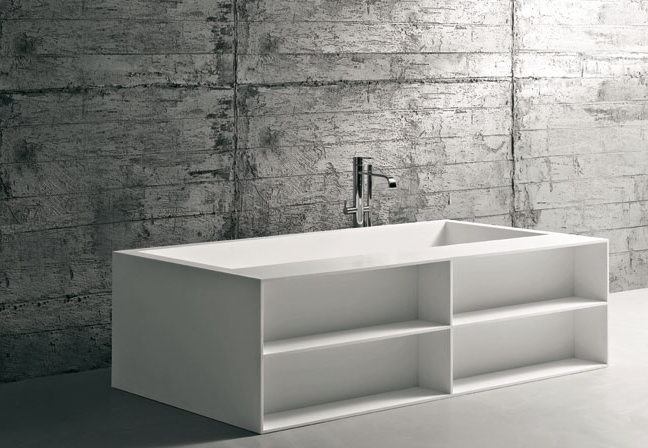 I love that the interior of this one is as special as the exterior. 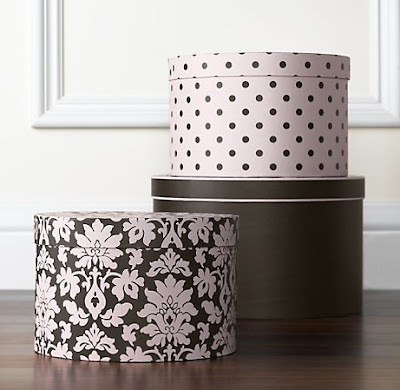 Restoration Hardware Baby & Child has this set of hat boxes. Update on April 28, 2012: Restoration Hardware Baby & Child no longer carries hat boxes. And yet another source is Queen of Hats. 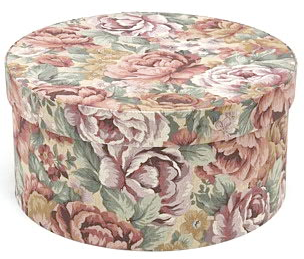 Update on April 28, 2012: Queen of Hats no longer sells hat boxes. 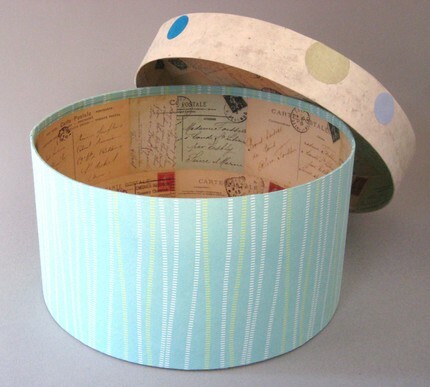 Jumping across the ocean to the U.K., Kate Forman Designs has some lovely hat boxes. 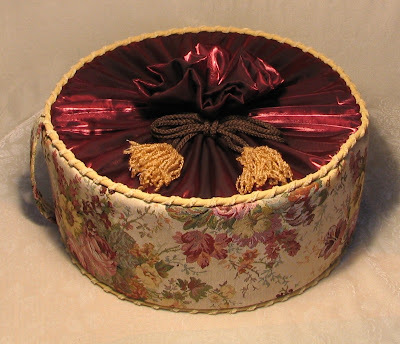 I've mentioned Pandora's Boxes a couple times before - here and here - but the company is worth another mention now that I'm doing a "hat box" post. The Empty Box Company also has some nice-looking hat boxes. The company says its boxes are made from "pH neutral board (that is made from 100% recycled pulp) designed to protect, preserve and prevent yellowing of any item enclosed." And finally, while we're focused on preservation, I wanted hop back to the U.S. and point out this archival hat box, even though it's not round, just in case you need that type of storage. 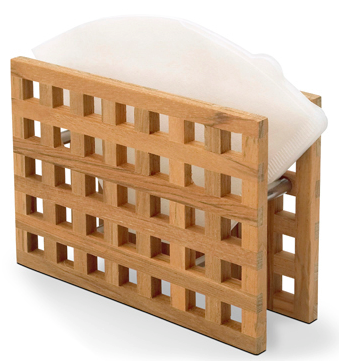 For all of us with limited kitchen storage space, items that stack or nest nicely can be a big help. 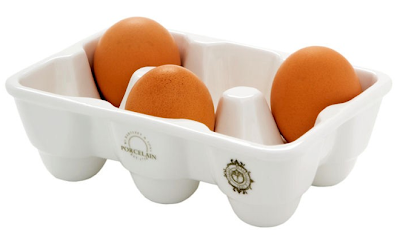 Mixing bowl sets and plastic food storage are places where such options abound. 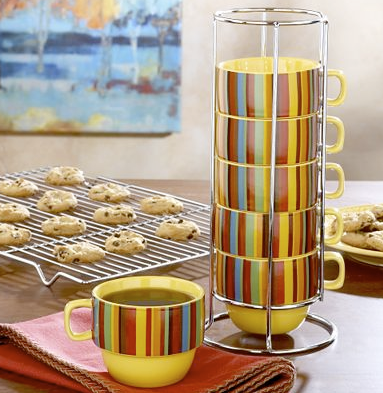 But what about coffee cups or mugs? Cost Plus World Market has options in solid colors and these stripes. 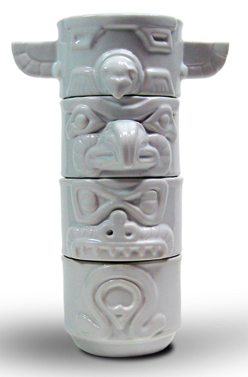 And here's something very different: totem cups. 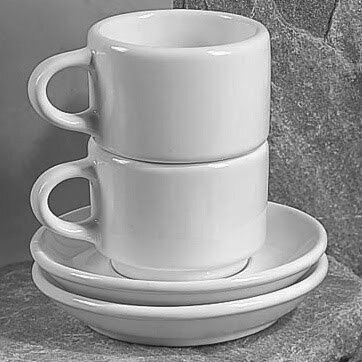 Other places to get stacking mugs include Crate and Barrel and - going further afield - Ceramic Tableware House Sendirian Berhad in Malaysia. If you want stackable glassware, you could consider the Picardie glasses from Duralex - available from Cost Plus World Market, Williams Sonoma, Design Within Reach, History Company and more. 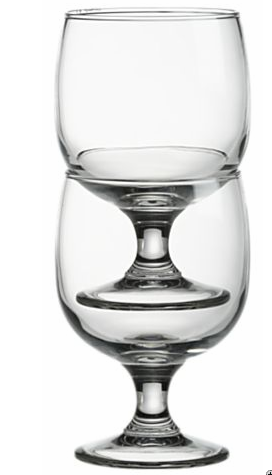 [via Francophilia] Update on August 26, 2013: Design Within Reach no longer carries these glasses. And here are some that are glass. 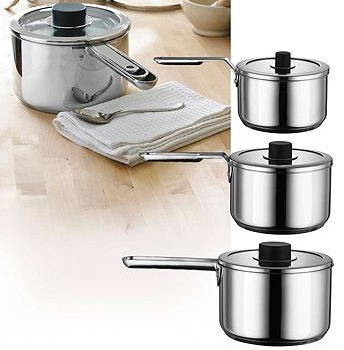 Moving on to another part of the kitchen, I was taken with the Stellar Eazi Store Pan Set, which Lakeland calls the "Russian dolls of the cooking world." 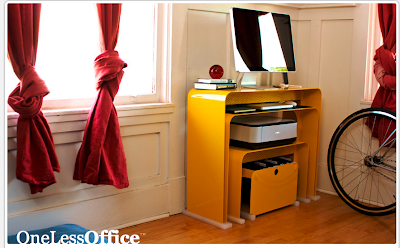 And of course, it's not just kitchen items that can stack or nest - as the folks at Heckler Design so beautifully illustrate, with OneLessOffice. My April 2010 newsletter is now available. - Activating the mysterious power of the infinity symbol. - Creating a blue-light cocoon for protection. - Clearing negativity by visualizing rivers of light. Do not cause yourself stress by being indecisive about what to keep and what to throw away. When in doubt, keep it. It will get junked in the next round of clearing in six months' time. 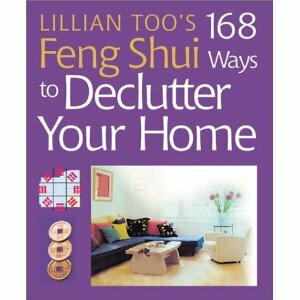 ... Clearing clutter is not a one-time thing. You'll often read advice to box up those "not sure about" items, and get rid of them if you don't go into the box in 6 months or a year. But this easier approach is the one I use in my own home. If I follow Peter Walsh's advice to "imagine the live I want to live," it's usually easy to make keep-vs-save decisions. Does the item in question enhance that life, or not? But I find that I can get indecisive when I'm going through a transition, and I'm not quite sure if certain things will be useful or not in the future. Also, sentimental things can cause me to pause. Do I still feel attached to that item, or is it time to let it go? Sometimes the right answer to "Should it go?" is "Maybe not quite yet." As an organizer, I think any of these can be fine. 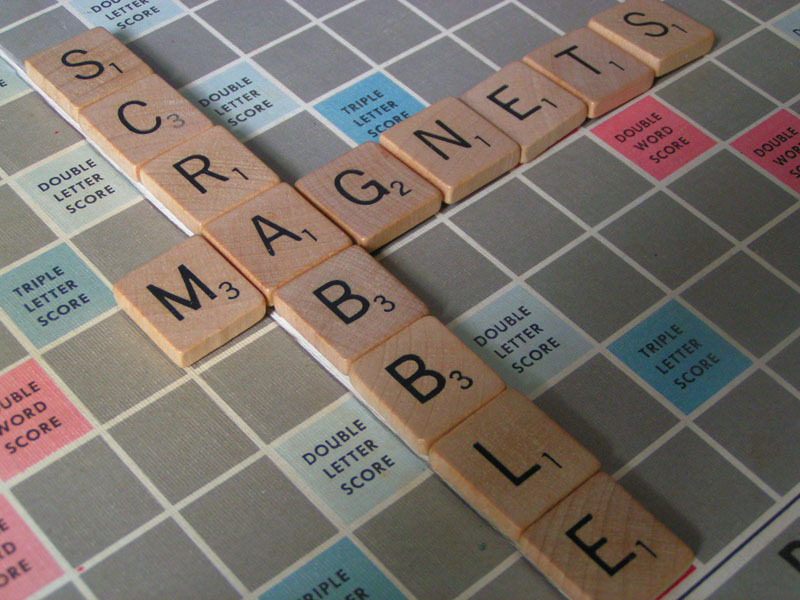 I'd just suggest that if you've got the magnet collection thing going, be sure to manage that collection like any other - make sure you still really like all those magnets. 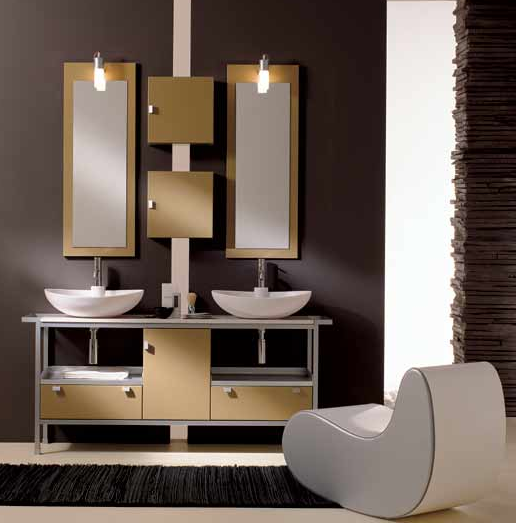 And go through those photos and things, too - make sure everything on the door is something you really want there. One of the least wonderful features of the new upscale refrigerators is that their doors do not hold magnets. 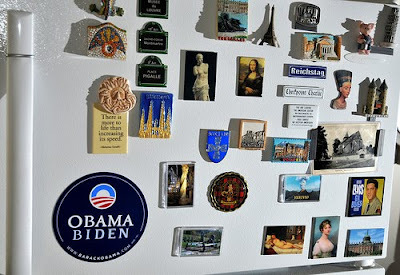 Refrigerator door art is a great form of popular culture, and the next time we go refrigerator shopping - which won't be for a while, because of the Great Recession things we found ourselves involved in - I'm taking along a handful of magnets. If they bounce off, that refrigerator is off my list. 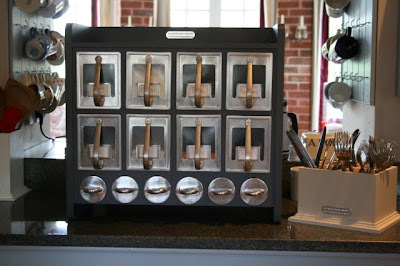 And Naomi Selden recently featured a clean-the-refrigerator-door tip and got all types of responses. For those of you who do like using magnets - either on the refrigerator door or on a magnet board - these Scrabble magnets are my latest find. I subscribe to a lot of blogs - some for work, some for personal reasons - but as of now, I subscribe to about 20% fewer than I did a few hours ago. That's because I decided to follow Scott's lead. - Blogs that might indeed provide good information sometimes, but the format is just too annoying. That includes blogs with color combinations that hurt my eyes, and blogs that don't leave any space between the paragraphs - also hard on the eyes. - Blogs I thought I should read, because they relate to my industry, but I just didn't enjoy them. There are plenty of industry-related blogs I do enjoy reading; there's no point in forcing myself to read the others. - Blogs I tried out for a while, but they just didn't capture my attention, so it was time to end the trial and take them off my list. It's amazing how good it feels to do even a little decluttering like this! And of course it will save me time every day, too. Technical note: I subscribe to blogs in Google Reader - an RSS reader - rather than by e-mail. If you want to learn about RSS, you can watch the RSS in Plain English video or read The Simple Guide to RSS Readers. Like to support small companies creating wonderful hand-crafted products? 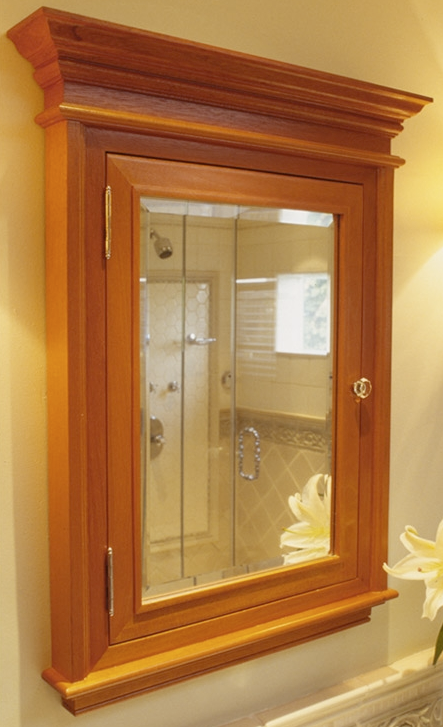 Take a look at the marvelous medicine cabinets from Wood Essentials of Brooklyn, New York. I wrote about these medicine cabinets (and others) way back in August 2007, but Wood Essentials has now added a new line with crown molding. 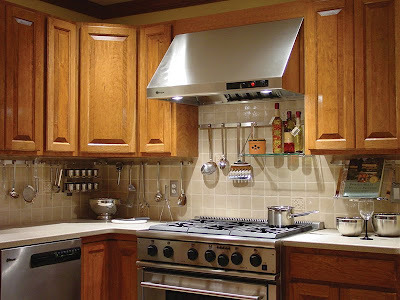 The cabinets come in both wall-mounted and recessed versions. Do you know how your local recycling works - what's accepted, and what's not? 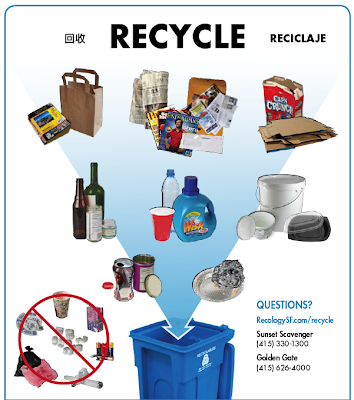 I find that many of my clients do not know - and that their local curbside recycling programs often accept much more than they realized. 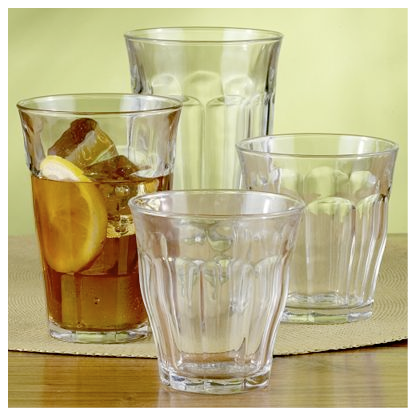 Here are a few items that often cause confusion. 1. 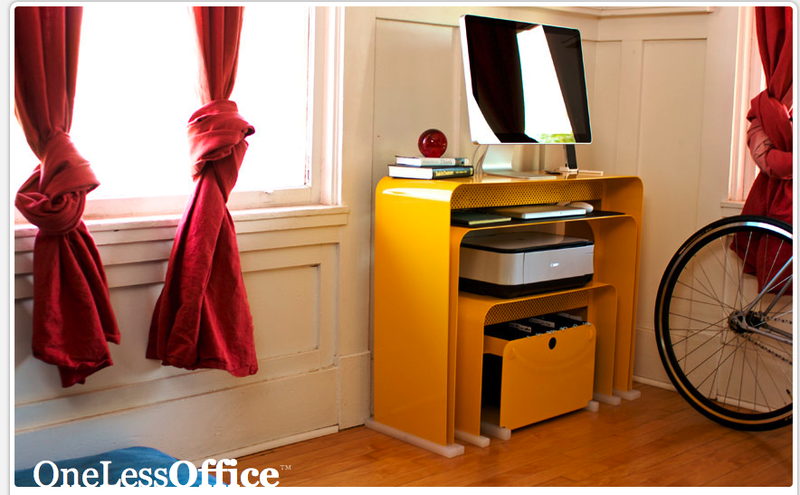 Envelopes with plastic windows, sticky notes, glossy paper, paper with staples, cardboard with tape, paperback books. When recycling programs were first starting up, many of them did not accept these items. I just checked six programs in the San Francisco Bay Area, and they all accept these items now. Yes, many paperback books can get reused rather than recycled. But sometimes a book is so battered, or so out of date, that recycling is the only practical option. Some recycling programs around here take shredded paper if it's placed in a paper bag that's stabled shut. Other programs want the shredded paper placed in a clear plastic bag. 3. 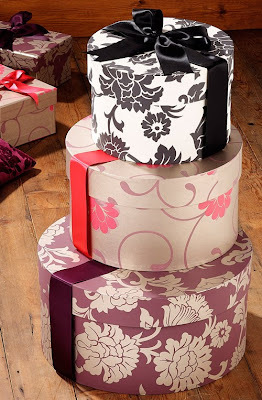 Photographs and photo paper. Some local programs say that photographs are plastic-coated paper and not recyclable. However, other programs list them as perfectly acceptable. 4. Black plastic food containers and to-go clamshell containers. Some programs in my area take these, and some don't. So check the rules for your local program; you may be in for a surprise or two! What do you do with all those e-mail messages you want to save? Since I wrote about applying some of the suggestions from The Hamster Revolution to my own e-mail, people have asked me for more detail. The numbers are actually part of the file name, and they ensure that "clients" come before "admin." Since the book is focused on a work environment, but acknowledges that you'll also get personal e-mail, the author says you might want to add another folder for personal messages. Admin includes electronic receipts for work-related purchases, messages from my business insurance company, etc. I don't have a lot of admin. Associates includes sub-folders for BNI (Business Network International) NAPO (National Association of Professional Organizers), NSGCD (National Study Group on Chronic Disorganization), etc. Clients is self-explanatory, isn't it? Freecycle is a folder I added, because I'm both a Freecycle moderator and an active Freecycler, so I access this folder a lot and I wanted it at the top level. Outputs include files related to the magazine I edit, my blog, my newsletter, etc. And Personal is also self-explanatory. While these six folders take care of most of the messages I'm saving for reference - my archive files. 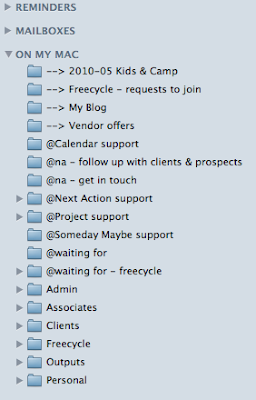 I used to have many more top-level folders, and I much prefer this more streamlined approach. But I did add on two other sets of folders. 1. The four folders at the top, with the --> in front of the name, are just extremely active folders that I want easy access to. The first one is the issue of the magazine that I'm currently working on. 2. The folders with the @ in front of them will look familiar to those who use David Allen's Getting Things Done. These are folders related to things on my calendar or one of my to-do (and related) lists. So Calendar has detailed information about things on my calendar. Next Actions (or na) are the messages related to things on my to-do lists. Project Support is information about larger efforts, not simple to-do items. Someday Maybe relates to things I might want to do. Waiting For are messages where I'm awaiting a reply. 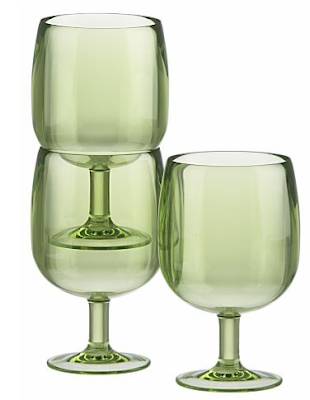 Waiting for - Freecycle are messages about pending pickups of Freecycled items. This is what works for me - a blend of two systems, with some of my own tweaks. But there are a number of other approaches that work for others. A number of people argue that filing e-mail is just a waste of time, since search tools can allow you to find any message you want. Merlin Mann said, "Organizing your email is like alphabetizing your recycling!" 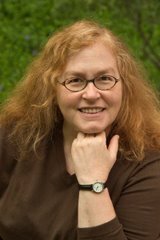 Gina Trapani suggests that all you really need is three folders: Follow Up, Archive, and Hold (a temporary holding place for important messages you'll be referring to in the next few days). I understand the arguments for this approach - and it does have a lot of appeal. I'm continually simplifying my filing system - but I'm not ready take the plunge to this system yet. If you have an e-mail filing (on non-filing) system that works for you, I'd love to hear about it! Looking for jewelry storage solutions, and none of the usual solutions seems quite right? I've recently found some interesting products to help. Jewelry Drops has this piece for your necklaces. 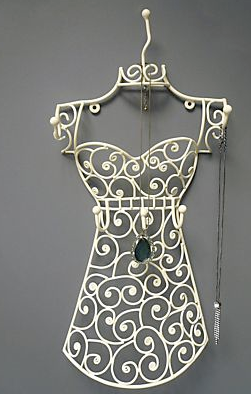 And finally, while I've written about jewelry mannequins before, this wall-mounted mannequin was new to me. Update on June 19, 2014: I'm no longer finding this product for sale. 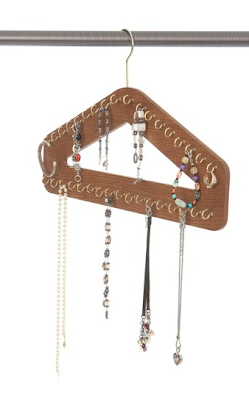 Want to see more jewelry organizing options? You can see all my jewelry-storage posts here.